All applications must be received by Berkshire Taconic no later than midnight, March 1st, 2019. • Applicants must be students, teachers, administrators, staff, parents or members of the Southern Berkshire Regional School District community. • Proposals must augment and enrich the educational experience of students in the school district and should not be part of core curriculum. • Preference is given to proposals that request funds for the direct costs of initiatives rather than staff salaries. • Preference is given to proposals that provide matching funds through in-kind, volunteer, or cash donations. • Preference is given to projects that will serve as a catalyst to broader educational opportunities and are likely to have a lasting connection with other school offerings. This grant cycle, the Funds have allocated an aggregate pool of approximately $38,000 for all awards. Because we expect many worthy projects to be competing for these limited funds, we ask that all applicants make a special effort to ask only for that amount actually required and to look hard for matching funds through in-kind or other cash donations. We will continue to consider requests for multiple-year funding (up to three years). Grant recipients may be expected to make in-person presentations to a joint Eagle Fund/Janet’s Fund board at year end and to write a narrative grant report, demonstrating what was achieved with the grant funds. • A narrative description of the project. Include specific information about project goals, how the goals will be reached, a project timetable, and a brief description of the qualifications of the project leader. If you have received grant funds in prior years from the Eagle Fund/Janet’s fund for this same project, explain why you believe another year of funding is necessary or appropriate. Please keep in mind that the mission of the Eagle Fund is to fund programs that stretch beyond ordinary school offerings; Eagle Fund monies are not available simply to fill budget gaps. • A budget containing your project costs. If the budget contains a request for payment of a person’s time, indicate the hourly rate and the number of hours projected. • If this is not a new project, please indicate how it has been funded in prior years and why support from this fund is needed. • If you are requesting funding for equipment, please indicate why the item(s) is not covered through the school budget. • Any additional documentation you feel would be helpful to the committee in making its decisions. • Applications from individuals or groups who are not teachers or school administrators must be approved by a principal or administrator. • The ability of the applicant to carry out the project. Applications will be reviewed by a committee of representatives of The Eagle Fund & Janet’s Fund. Members of this committee include SBRSD residents who are active in community affairs, as well as the Superintendent of Schools, faculty members, and students. The Eagle Fund’s awards are approved by the Eagle Fund Board of Governors. Their recommendations will be reviewed by Berkshire Taconic’s Board of Directors. Applicants will be informed of grant decisions within one month of the deadline date. Please contact Amy Taylor at Berkshire Taconic Community Foundation at 413-229-0370 or ataylor@berkshiretaconic.org. In March of 2015, the Mt. 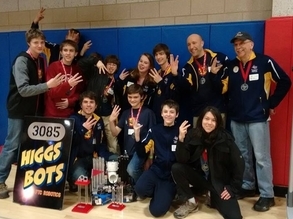 Everett robotics team won the FIRST Tech Challenge (FTC) State Championship for the third consecutive year.